To get started using Matrix, pick a client and join #matrix:matrix.org. You can also check the Matrix Clients Matrix to see more detail. If you like glossy and feature-rich web clients, try Riot. Available on the web and as a desktop client. 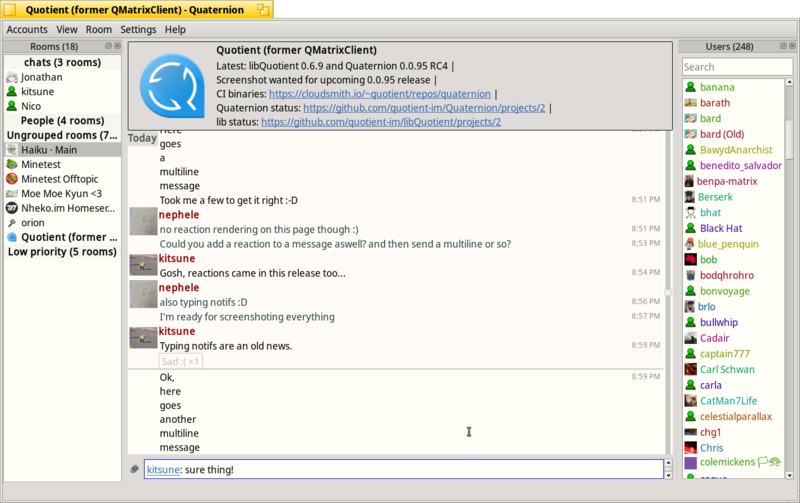 A cross-platform desktop client based on Qt5/QML. 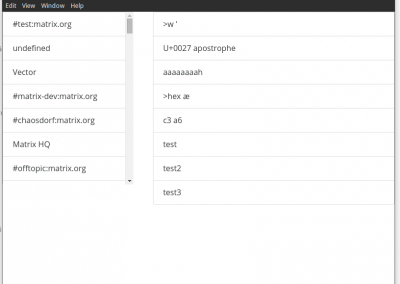 Nheko is a glossy native desktop app for Matrix, based on Qt5. If you're looking for a client for GNOME, try Fractal. Matrix is a whole ecosystem of matrix-enabled clients, servers, gateways, application services, bots, etc. If you’d like to learn more, this page aims to collect all known Matrix projects. To add a new one (or update an existing one), you can submit a PR to the matrix.org project on github - the existing projects can be found here - or just let us know in the #matrix:matrix.org room. PTO is an IRC frontend to the federated Matrix network. A neutral iOS client showcasing Matrix capabilities and implementation. 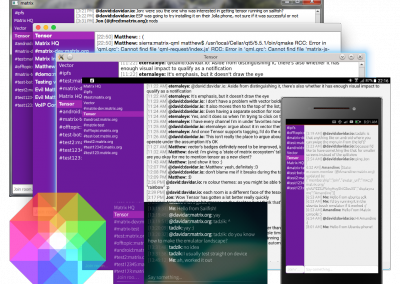 A neutral Android client showcasing Matrix capabilities and implementation. Matrix.org’s legacy AngularJS web client. 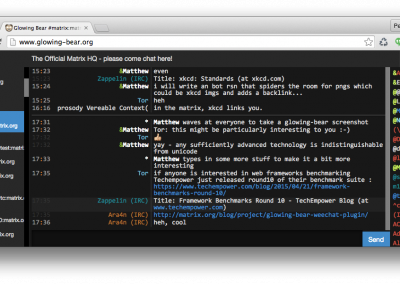 A great IRC-style web interface to Matrix. Revolt wraps Riot to provide better integration with desktop environments. An IRCd implementation backed by Matrix. A web client for writing news stories, personal blogs and more, built on matrix. Fractal is a Matrix Client written in Rust. A windows focused QT Client written in Golang. 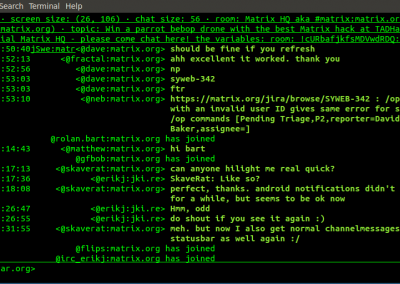 Simple chatbot for matrix.org, inspired by rbot. Palaver is a chat client for Matrix written in Kotlin. 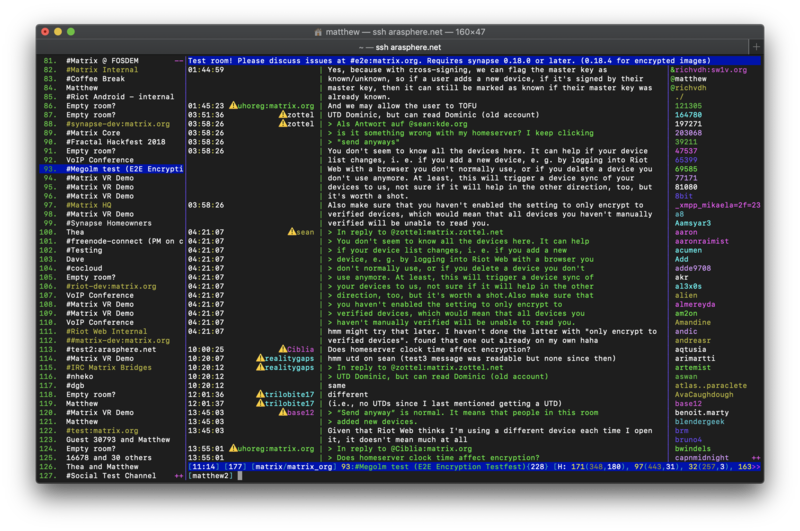 A Matrix client for Emacs! Ruma is a server written in Rust. A WIP toy Matrix server implementation in Elixir. Transform is a matrix homeserver built using Typescript and Redis. This project bridges to Matrix, via the AS API on the Matrix side, and a Gitter user on the Gitter side. 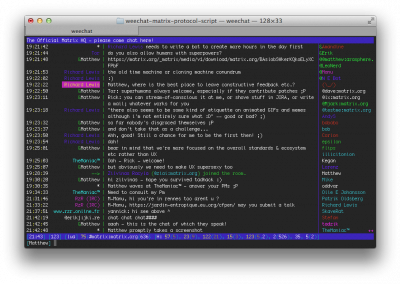 This project bridges Rocket Chat to Matrix. 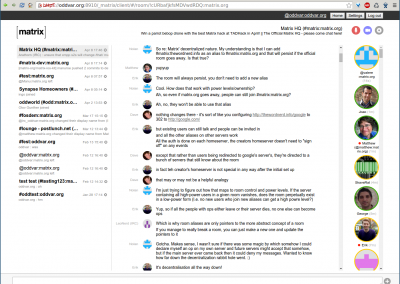 Python 2 application using Twisted that bridges the Matrix chat network with Gitter. This project bridges Telegram to Matrix. This is a puppeted Facebook bridge for Matrix. 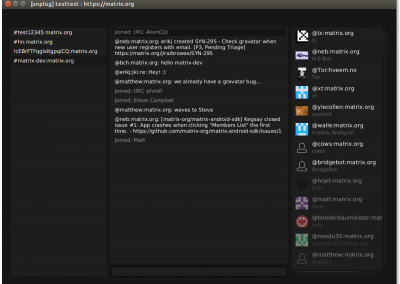 Python 2 application using Twisted that bridges the Matrix chat network with the Gitter system. Single-user Matrix.org Application Service (AS) to bridge SMSes to the Matrix network! A Matrix library for go currently in development. A bot for controlling MPD over matrix. Posts links to emails in Matrix rooms. Ideal for newsletter distribution. Bot for bridging Matrix and Mattermost, IRC, XMPP, Gitter, Slack, Discord, Telegram, Rocket.Chat, Hipchat(via xmpp), Steam. A bot which listens to JIRA Webhooks and sends stuff between Matrix and Jira. A bot for playing D&D. A non-puppeting (i.e. bot) bridge between Matrix and XMPP group chats. A maubot that rolls dice. Has built-in calculator. A maubot that tracks the karma of users. POC designed to bridge Matrix rooms to FB chat. This project bridges between matrix and telegram. sygnaler is an alternative Push Gateway for Matrix written in swift. Enables you to keep a record of all messages you have received. FAQs and more. Bot-friendly collection of Matrix knowledge. Also suitable for humans. A github repository tracking community requests for bridges, bots, and more. Python bindings for the Olm C library.